Recently, I got to lay my hands on a Fischer MD-2 for this review (courtesy: SweatLessHands). This post provides a series of pictures I took that should give you a pretty good idea of how the machine looks like. 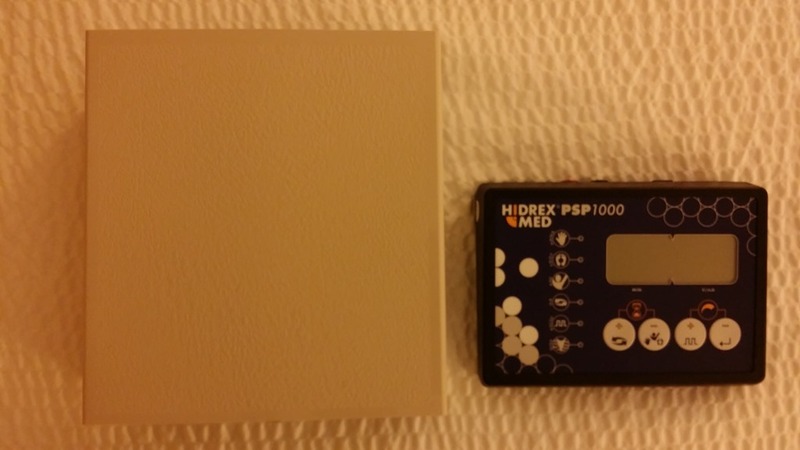 I will cover my experience of taking treatment with Hidrex PSP 1000, Idromed PS, Fischer MD-1a and Fischer MD2 in a separate post. 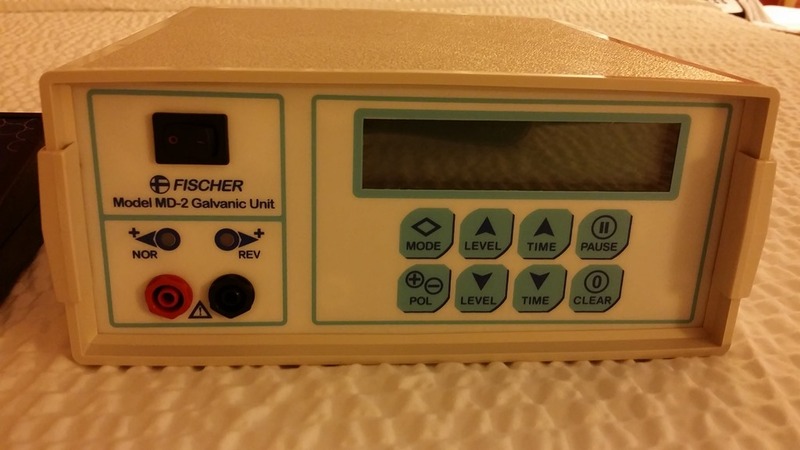 Fischer MD-2 is the higher end machine available from the leading iontophoresis machine manufacturers in US (R.A. Fischer). The machine appears/feels very rugged and high quality in terms of build. The MD-2 is box shaped, with most of the controls on the front panel. 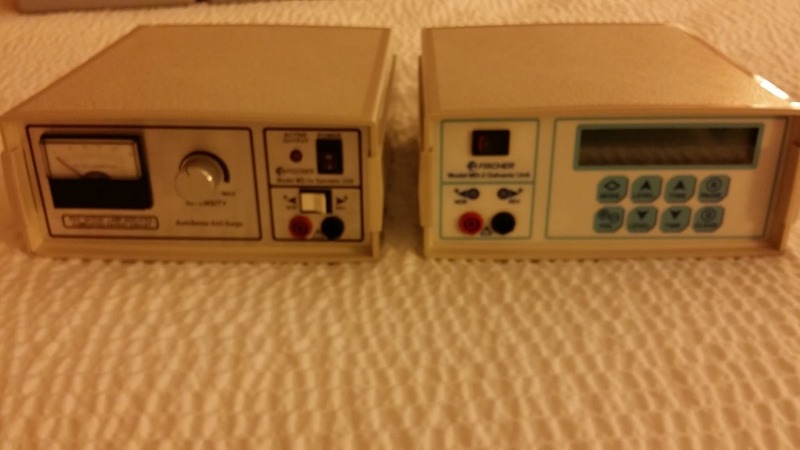 The MD-2 has lots of options available to customize your treatment – including polarity, current, time etc. The front panel also has the on/off switch (top left), and the connectors to connect with the electrodes in the water tray. essentially, everything except the power inlet is on the front panel. One thing that will stand out, especially in comparison with other machines in the market is how sturdy this is built. 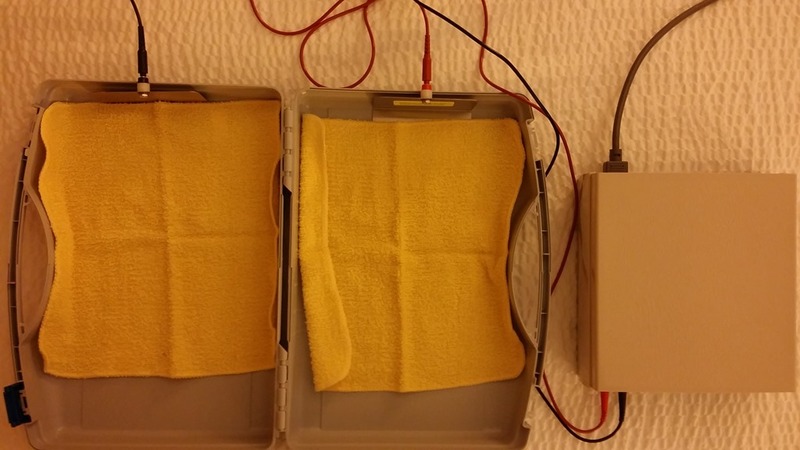 While it’s a bit bulkier, practically that should not be an issue (unless you travel a lot and want to carry the iontophoresis machine around). What matters is how well this machine works for your condition, and in that department, MD-2 is as good as any other! There is not much going on the backside of MD-2, except the power inlet (bottom right). Once plugged in with the main power, the electronic display provides all the information user needs to see (time left, current etc.) The display is user friendly (as compared to a Hidrex), and its easy to understand what’s going on. It should be easy to get used to this machine after first sitting. The main control unit is plugged in to a power source (on the back side). The main control unit is also connected to booth the electrodes that are placed inside the provided trays. 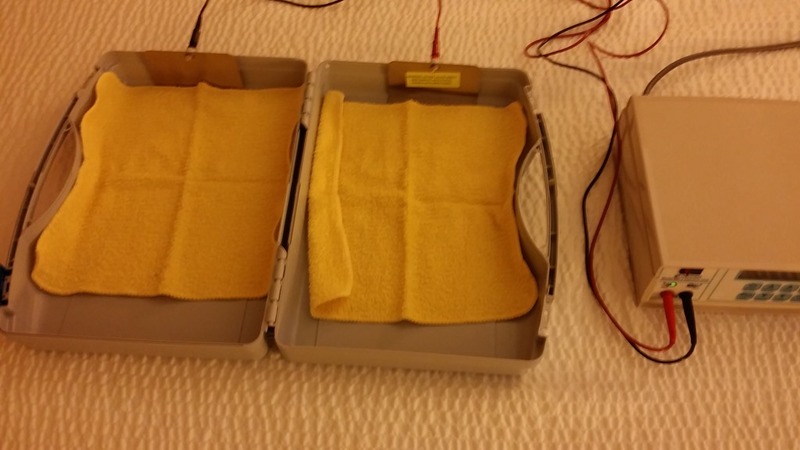 The trays are covered with provided fabric material to prevent direct contact with the electrodes. You will need to fill the trays with tap water (and any additives, if required), select the settings and dip the body part in the trays. 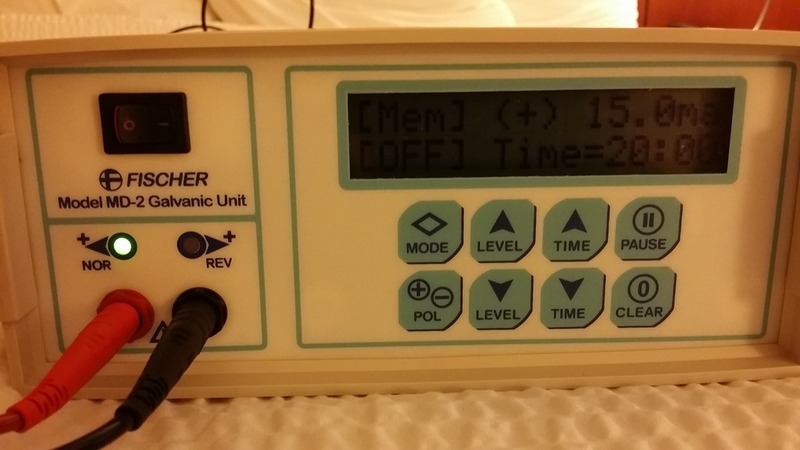 The treatment will then begin and you can monitor the remaining time on the control unit. You can take out your hand/feet at any time without experiencing any electric shock as the control unit monitors that for you. The entire setup is quite intuitive and I did not need to refer to the instruction manual! 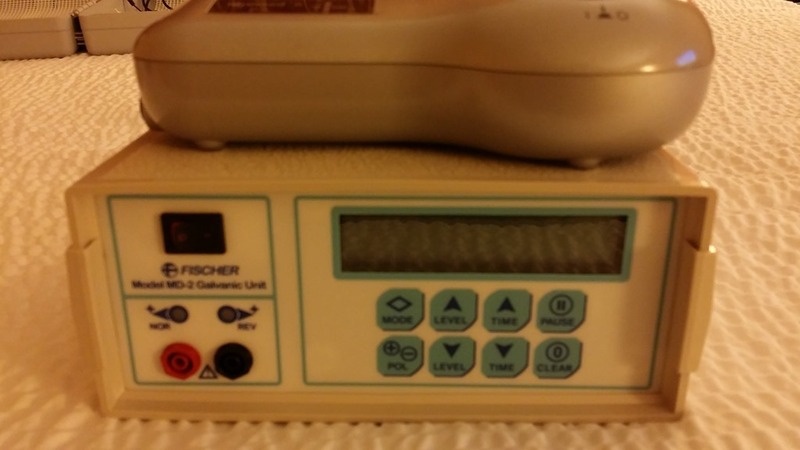 The Fischer MD-2 machine is bigger and heavier than the Hidrex and Idromed iontophoresis machines. The big size, by itself is not a big issue in my opinion, unless you’d like to travel a lot with your machine. The machine does feel much more sturdy than the European manufacturers and given you’ll probably not buy many of these over a lifetime, it may make sense to go with one that is robust. 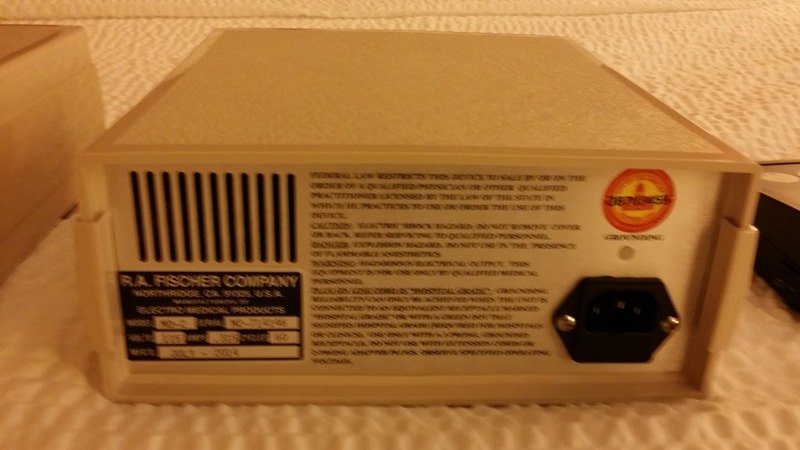 Rent Iontophoresis Machine! 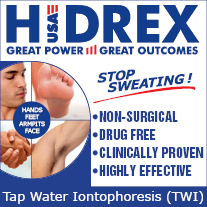 Idromed 5 PS Iontophoresis Machine in Pictures Hidrex vs. Idromed vs. Fischer: Iontophoresis Machine Showdown!